Ahh, Summer. That wonderful season that brings us delicious, sweet corn, which grilled in their husks are so tender and sweet that they don’t even need seasoning! I thought of making a cold soup because, let’s face it, we in Southern Nevada apparently live on the surface of the sun. Temperatures soared to 116 degrees this weekend and anything cool and refreshing was a most welcome thing. I adapted this recipe found on Epicurious and I used a lot more corn and I also did not strain the soup. I think that step is a purely personal issue. I enjoy texture in soup and I find that it makes for a more substantial dish–a soup that “eats like a meal”. But if you prefer a smoother, creamy soup, straining it would give you that result. This soup has a refreshing Southwestern flavor with a hint of heat and a little splash of lime and would make a great first course for a summery dinner! 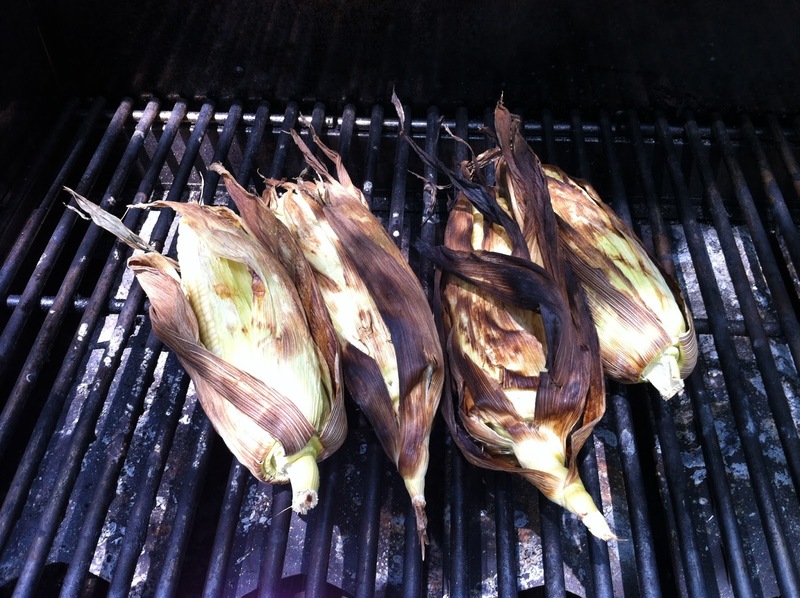 To grill the corn, peel the husks back, but don’t remove them. Clean away the cornsilk and replace the husks. 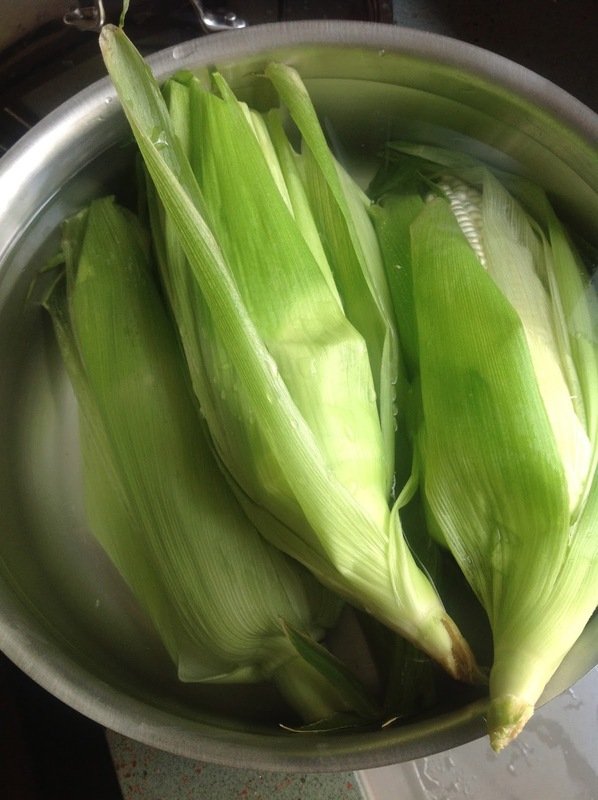 Fill a pot with cool water and one tablespoon of salt and allow the corn to soak for about 10 minutes. 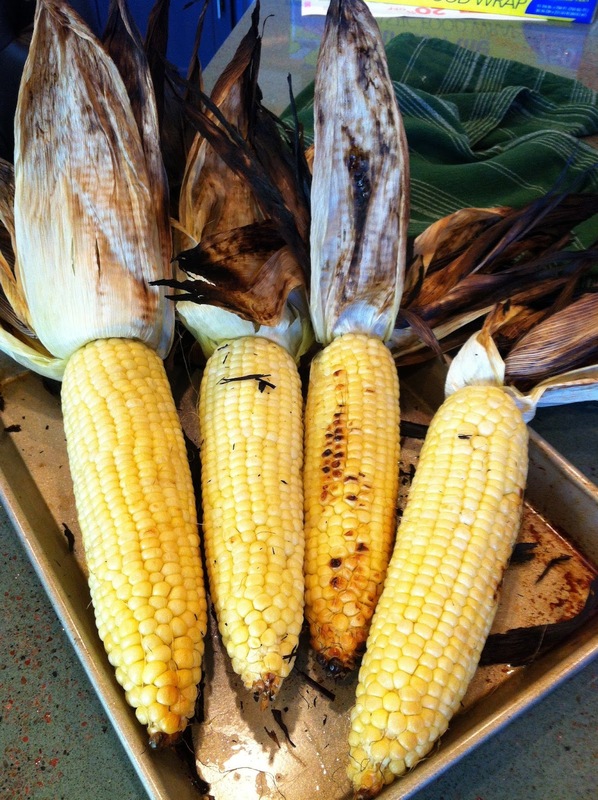 Place the corn on the grill over medium, direct heat. Flip once every 5-7 minutes until the corn is tender and just beginning to char, about 25 minutes total. 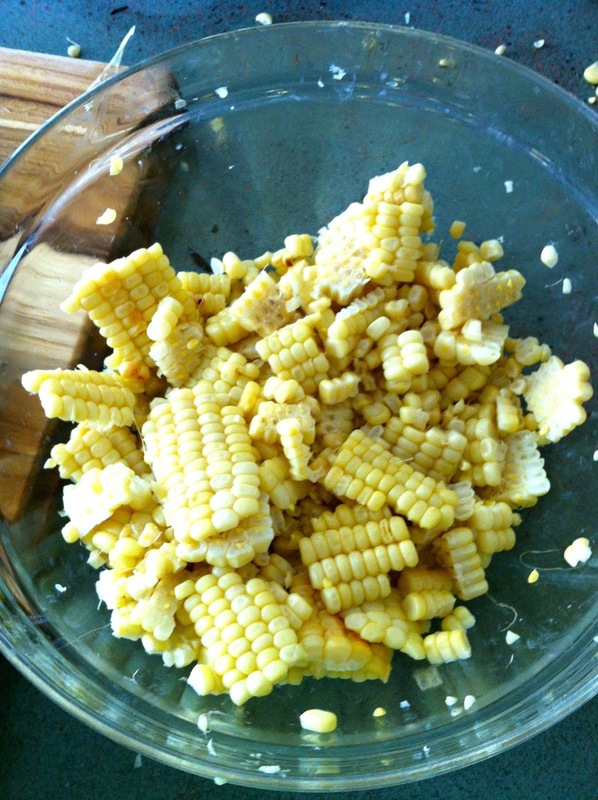 When the corn is cool enough to handle, slice the kernels from the cob and cut the cobs in half. Add the kernels, cobs, serrano pepper, 1 cup of the chopped onions and salt and pepper to a large saucepan or pot. Add the vegetable broth and water and cook for about 20 minutes, or until the broth has reduced. After the broth reduced, I then placed the soup in the refrigerator to cool completely. 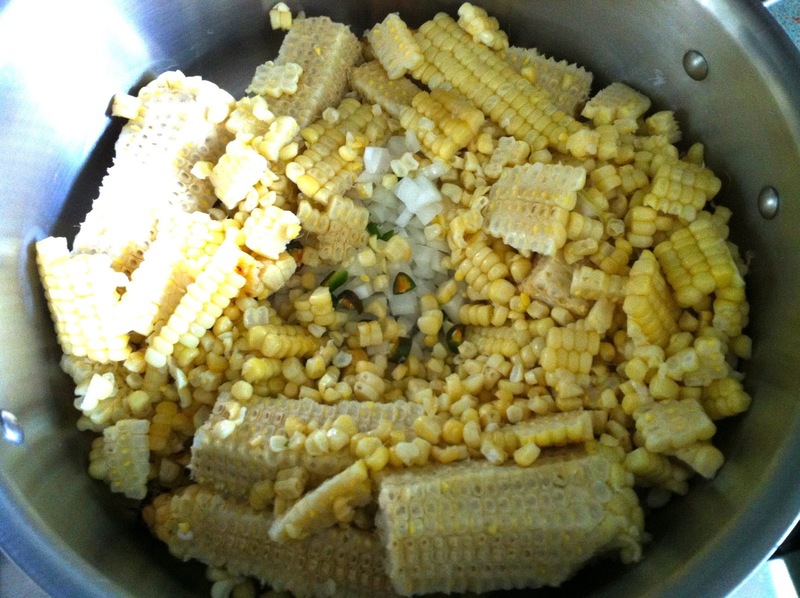 After the soup cools, remove the corn cobs and puree the kernels and broth in a food processor. I did this step in two batches so as not to overload the food processor. During one batch, add one whole avocado and the remainder of the onion and puree until very smooth. If you prefer to strain the soup through a mesh sieve and remove the solids, you can, but I left the soup intact. Mix both batches of the soup together in a bowl or pot and add the juice of one lime, to taste. For the cilantro oil, simply puree the cilantro, oil, salt and the squeeze of lime juice in a blender or food processor. Set aside. Cube the remaining avocado and squeeze lime juice over it to keep it from browning. 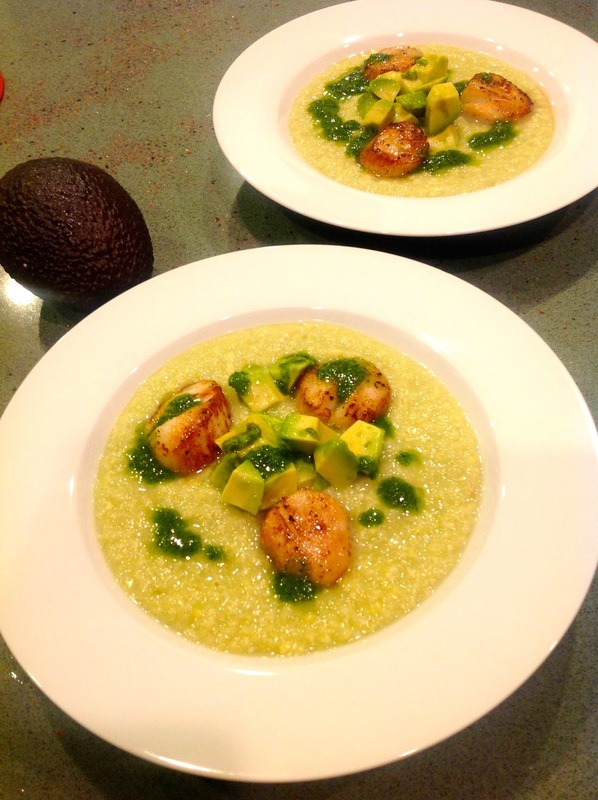 Serve the soup with avocado and the cilantro oil drizzled over the top. 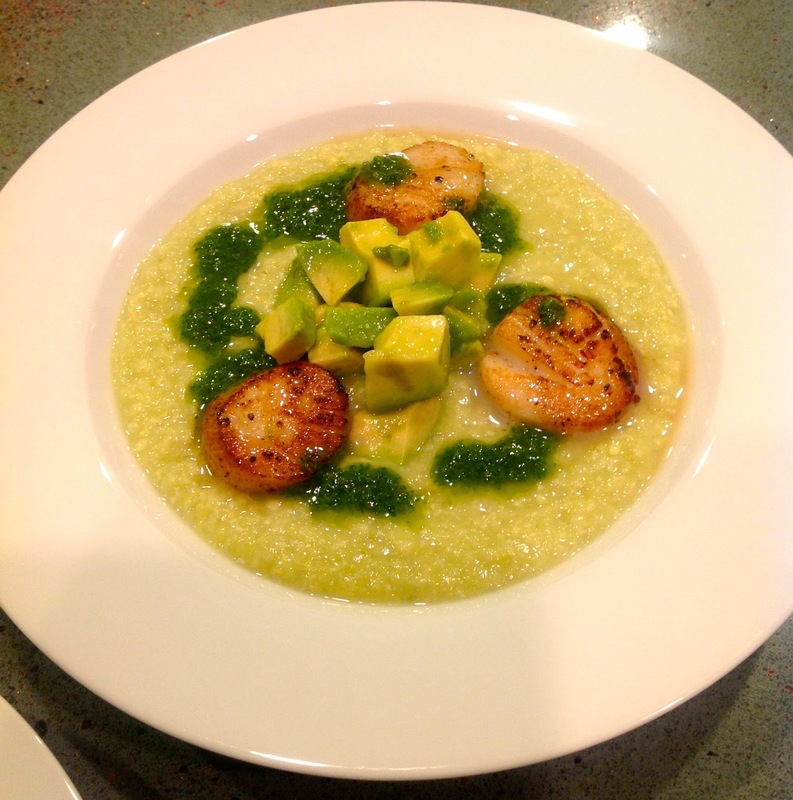 As you can see from the photo, I served it topped with seared scallops. Grilled shrimp would be equally fantastic!